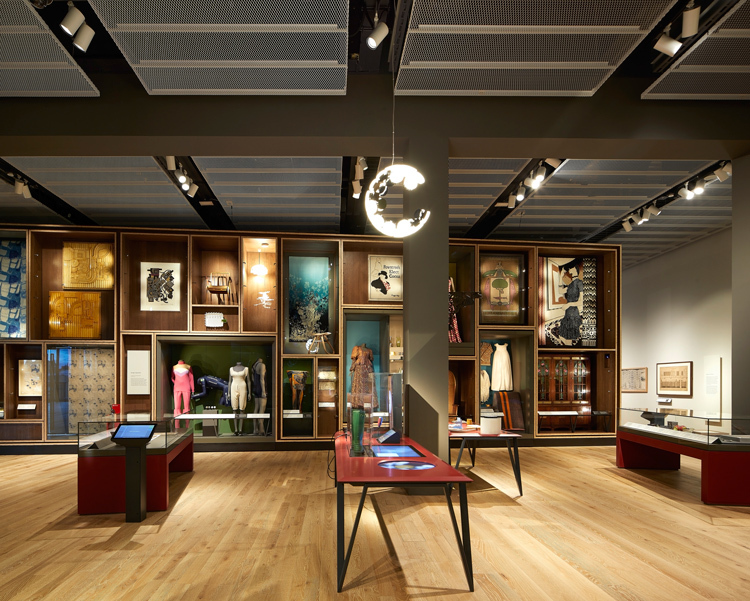 The new Victoria and Albert Museum opens to the public this weekend – we explore the grand space, which looks to spotlight Scottish design while also holding its own among other cultural giants by showcasing national and international work. Update 28 January 2019: Prince William and Kate Middleton will visit the V&A Dundee on Tuesday 29 January to officially launch the museum. The Duchess of Cambridge is the Royal Patron of the V&A. 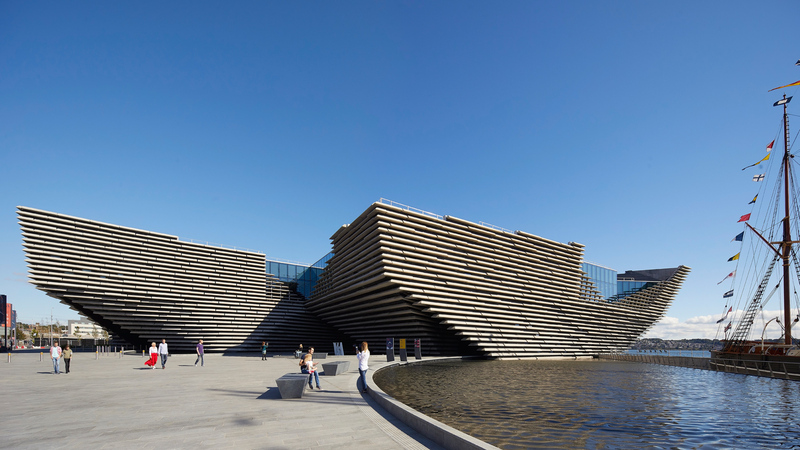 As the V&A Dundee prepares to open its doors, local communities are not only looking forward to exploring Scotland’s first major building devoted to design, but also the impact it is expected to have on the city. Just five years ago, Dundee was found to be one of the most deprived cities in Scotland, according to Government statistics. This was put down to many factors, including income and poverty levels, employment levels, access to education and healthcare, crime levels and the state of housing. 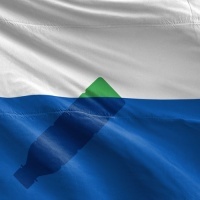 Since then, Dundee has developed a thriving cultural community, having been awarded UNESCO status as a City of Design in 2014, developed its own design festival, and been lauded for the success of the University of Dundee’s Duncan of Jordanstone College of Art and Design – which was found last year to be the best place in the UK to study design. 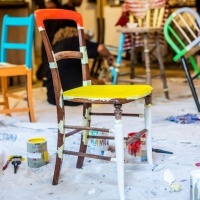 Until now, places like Dundee have lost out to cities such as London, Manchester and fellow Scottish cultural giant Edinburgh, with talented graduates emigrating to those major UK creative hubs, which also dominate in terms of exhibitions, funding, festivals and events. 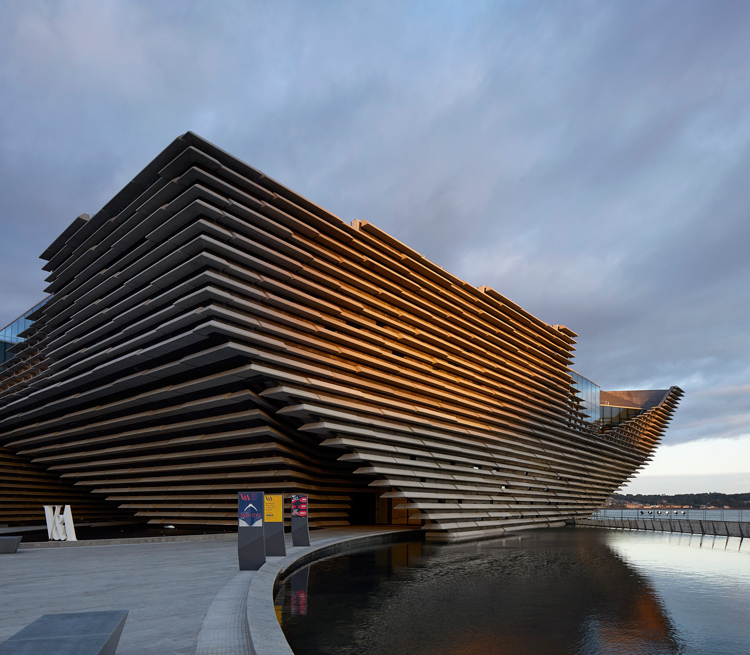 Now, with the birth of the V&A, Dundee is expanding its cultural growth and making a mark for itself – and with this will no doubt come a boost in employment, tourism, funding and talent retention. John Alexander, leader at the Dundee City Council, says the museum is already bringing a host of “tangible and intangible” benefits to the region. Speaking at the striking new building on River Tay waterfront, he says: “This institution, this building, has made a difference even before it has opened its doors. “The renewed confidence, sense of pride and fire in the belly of ordinary Dundonians wasn’t there 10 years ago. Benefits to the city, according to the council, include a rise in tourism. To accommodate this, new hotels and restaurants have opened in the city, which are in turn expected to lead to economic benefits and new jobs, as well as an image improvement for Dundee as a place to “live, work and invest”. 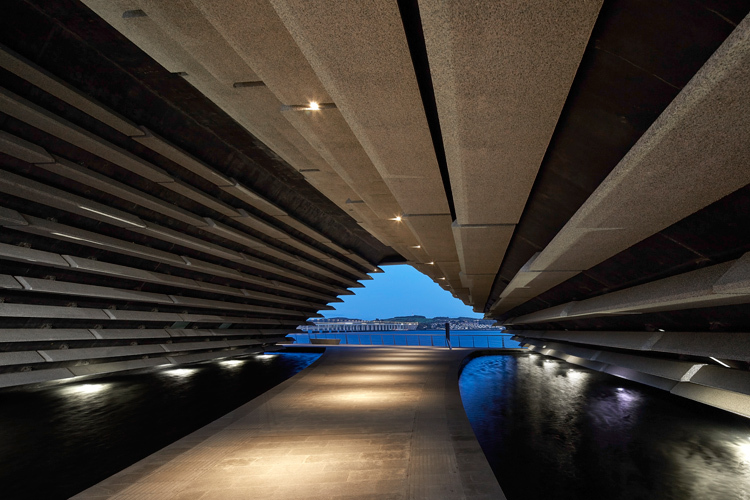 Opening to the public on 15 September, the museum designed by Japanese architect Kengo Kuma intends to “reconnect” Dundee to the River Tay as well as its maritime past, as part of a £1billion waterfront redevelopment. Resembling a Scottish cliff and mainly made from concrete walls holding pre-cast, rough stone panels, it is shaped like two twisting, inverted, pyramids with an archway through the centre and water pools linking it to the river. 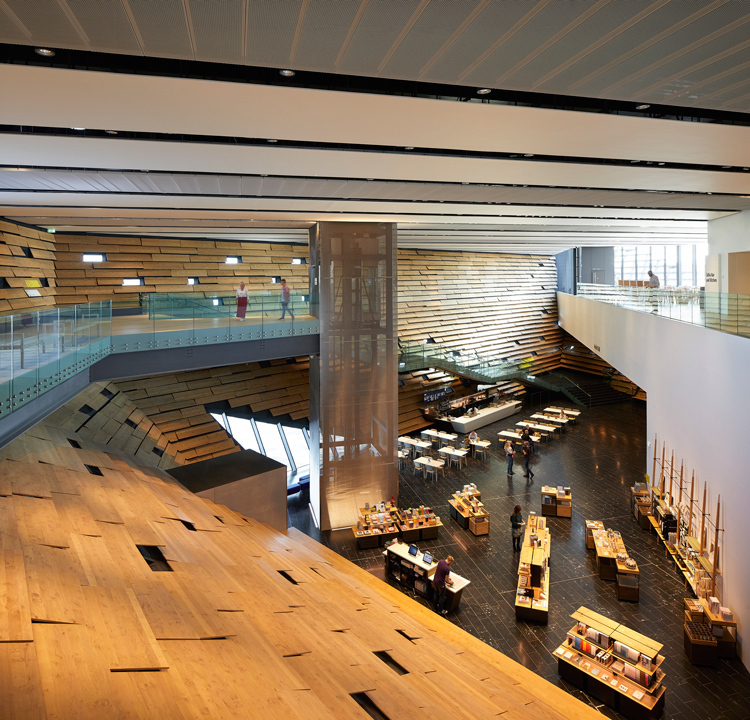 Branded as a “living room” for the city, visitors enter a large lobby area surrounded by sloped wooden panelled walls, with the main interiors designed by Kengo Kuma. Materials used include oak, Irish limestone floors and wall panels made of medium-density fibreboard (MDF) with oak veneers in “natural” colours, designed to be “soft”, “relaxing” and “welcoming”. An open plan café and shop, also on the ground floor, have been designed by Lumsden Design, which also designed the upstairs restaurant, aiming to make them “flexible” and “inspirational” spaces. The Scottish Design Galleries designed by ZMMA Architects and a second large gallery space for temporary exhibitions are upstairs. Also on this floor as a series of education rooms and auditoriums, a “designers in residence” studio, an open plan Michelin Design Gallery space for installations and contemporary design, a restaurant and a book shelf filled with design publications. There is also a sun-soaked terrace overlooking the river. Scottish Design Galleries, the permanent, free exhibition, features roughly 300 objects and pieces which relate to or are influenced by Scottish design ranging from the 1500s to the present. They come from the V&A collection in London, Scottish museums, external companies and contemporary designers. Meredith More, a curator at V&A Dundee, says: “This is really the only gallery where Scottish design is considered in its own right. There are lots of places you can go to see Scottish art or history, but this particular story is quite unique. Objects found inside range from a model of the Scott Monument designed by Scottish designer and carpenter George Meikle Kemp, to a pair of Hunter “wellies” that were designed to be entirely waterproof and made of 28 pieces of rubber, by a company that was originally called the North British Rubber Company, founded in Edinburgh. Other interesting pieces include an exhibit of Lemmings, a video game designed by DMA Design – now Rockstar North – which was founded in Dundee, highlighting the city as a hub for video game design. There is also a model of Maggie’s Cancer Caring Centre, which opened in Edinburgh in 1996, a giant “pop-up book” theatre set designed by Scottish artist John Byrne and posters from past Edinburgh Fringe festivals. More hopes the space will become somewhere for people from Dundee and beyond to reflect on Scotland’s past achievements, see current trends, and spark inspiration and debate for the future. Lucy Clark, senior associate architect and designer at ZMMA Architects, which has designed the Scottish Design Galleries, says the three parts of the gallery space each have “different atmospheres, colours, materials, and feels about them”. 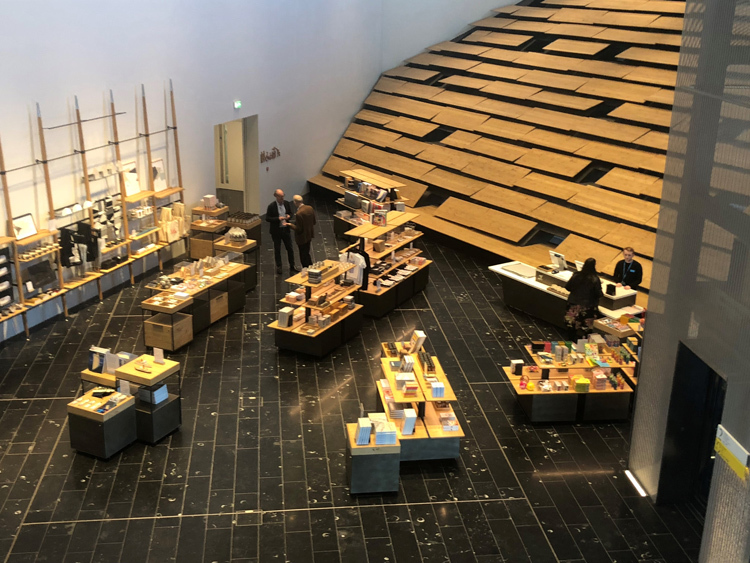 The first space looks at influences on Scottish design, be those historical, geographical, based on trade and industry, or design processes and ways of working – this section is primarily displayed in glass cabinets, with wooden floors and details and a few interactive tables. Second is design and society, which includes medical, industrial and architectural objects, exploring how design aims to improve lives. The third looks at design and imagination, exploring film, theatre, illustration and more, and aims to be more “immersive”. The Oak Room, a tearoom originally designed by Charles Rennie Mackintosh, can also be found in these galleries, positioned to create a “sense of surprise” as you don’t know it’s coming, according to Clark. She believes the new museum is “key to bringing Dundee into the triangle of great Scottish cities,” along with Edinburgh and Glasgow. Co-directors of Dundee-based design studio, Agency of None, Lyall Bruce and Ryan McLeod, who designed light and sound installations for the museum’s launch cultural event 3D festival, say the museum may help “retain” design talent and attract people back to Dundee. 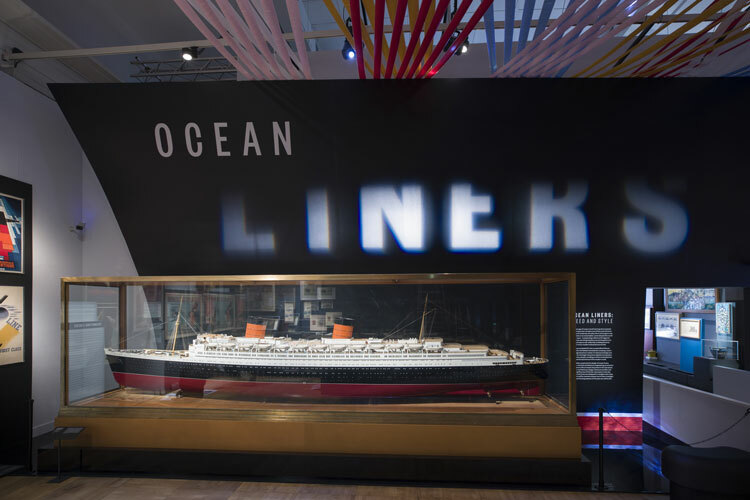 Ocean Liners: Speed and Style, is the museum’s first temporary exhibition in the second gallery space, sitting on the same floor as the Scottish Design Galleries, which explores the “golden age” of ocean travel from the 19th and 20th centuries. Originally exhibited at London’s V&A, More explains why the show, created by exhibition design studio Casson Mann, was chosen: “One of the ambitions for this museum was to be able to bring some of the V&A’s amazing, big blockbuster shows up to Scotland and there has never been an exhibition space in Scotland big enough to allow this before. More could not reveal future exhibitions at the time of publishing, but has promised a “really exciting and varied programme”, with some shows created specifically for the Dundee space.